Big Soda’s obscenely expensive winning streak has fizzled out. Berkeley, California has become the first city in the nation to pass a sugary drink tax specifically designed to reduce consumption. The penny per ounce soda tax (Proposition D) passed on Tuesday with a whopping 75.12 percent of the vote, in spite of the soda industry’s fevered campaign to defeat the measure. The tax will be implemented on January 1, 2015. Through its trade organization, the American Beverage Association, industry spent upwards of $2.4 million to defeat the tax, about $30 per registered voter. 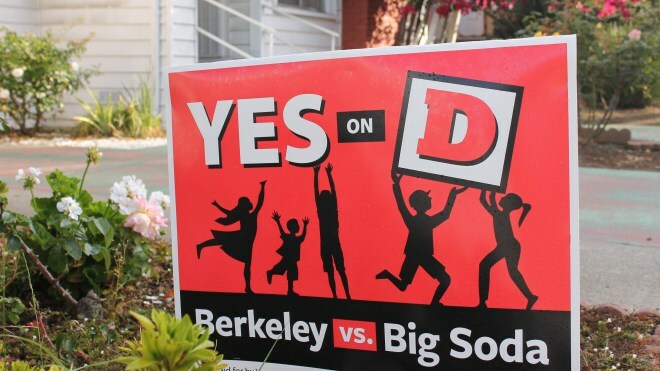 As industry sensed a loss in the making, it saturated Berkeley with No on D messaging including posters, billboards, mailers, full page ads, flyers, teams of canvassers, paid protesters, TV commercials and BART stations covered with anti-soda tax messages. It appears that their frenzied overkill backfired, making the community distrust them even more. Across the bay, there was more good news as San Franciscans showed solid majority support for their two-cents per ounce sugary drink tax, though the measure ultimately failed. Proposition E secured 54.5 percent of the vote but since the funds would have been earmarked for nutrition and recreation programs, the measure required a 2/3 vote to pass. Nevertheless, large, progressive cities will surely be emboldened to introduce their own soda tax thanks to the impressive San Francisco showing. Big Soda’s combined expenditures in Berkeley and San Francisco will likely surpass the $13 million it spent in New York State in 2010, to defeat the nation’s first penny per ounce soda tax proposal. It has been estimated that the beverage industry has spent over $100 million in the past five years to defeat soda taxes around the nation. So where does the soda tax movement go from here? Data will be collected in Berkeley, over the next year, to measure the effectiveness of the tax. This data will be added to the knowledge being gleaned from the first year of Mexico’s peso per liter sugary drink tax. In preliminary results, the tax has resulted in a 10 percent decline in purchases of sugary drinks while untaxed beverages show a 7 percent increase. Particularly notable within this category is the 13 percent increase in plain water purchases. Bloomberg will look at two key factors when deciding whether to back soda tax campaigns: The strength of the grass-roots campaign and whether the initiative can succeed.